Let’s start with the basic concept that, just like our own eyes, cameras need light to see. However some cameras need more light than others. Take for example the camera on my cell phone, anything short of a few hundred watts of light bulbs in the room and the pictures from my cell phone will look grainy and dark. Often black to the point of being worthless. That same thing will happen to security cameras when they make no claim to be low light capable and they simply don’t have enough light to operate. A camera’s ability to handle low light conditions is measured by its lux rating. To keep it simple Webster says a lux is “a unit of illumination equal to the direct illumination on a surface that is everywhere one meter from a uniform point source of one candle intensity or equal to one lumen per square meter.” Simple being a relative term of course. So when you see a camera that claims to be “low light” you know it means it will not require a great deal of light to operate. To better put things in perspective here are some common values for lux: A moonless night 0.002 lux, a quarter moon 0.01 lux, a full moon 1 lux, and standard living room light at 50 lux. Using the above lux measurements as a rough guide imagine your own low light situation, be it your bar, your back yard, your warehouse etc., and make sure you get a camera that’s going to do the job for the environment. One such camera to consider for low light applications is a low light bullet camera featuring the Sony EX-View chip set. The Sony EX-View chip set is the key component in the camera that enables it to provide a clear bright picture even in low light situation. This particular low light bullet camera has a lux rating of 0.05 but values as low as 0.002 are not that uncommon. Benefits of low light bullet camera include some great features such as they are inexpensive, easy to mount, most often weatherproof, and indiscreet. 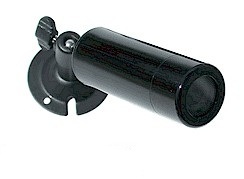 These characteristic make low light bullet cameras a great fit for a bar, the exterior of your residence or place of business, or even as an all purpose camera to cover both interior and exterior spaces when the light source is not constant. For more information on low light bullet cameras and how they can help meet your surveillance needs call 877-422-1907 today! Follow this link to learn more about how a low light bullet camera could be a part of your bar surveillance system.